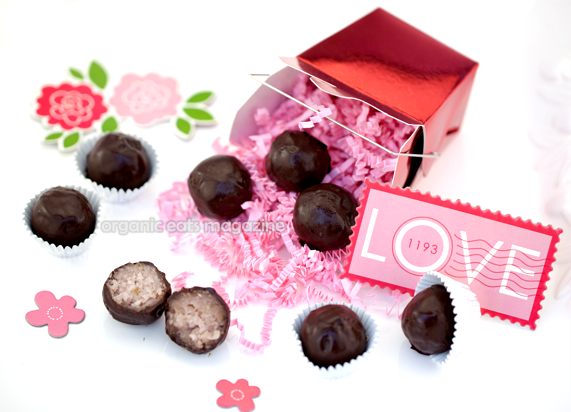 Coconut Truffles are a healthier version of the traditional truffle. This truffle recipe is plant-based and Paleo diet friendly because it is gluten-free, dairy-free, refined sugar-free. Plus, this recipe is an easy to make candy treat that won’t blow your weight loss plan. If you love mounds and almond joy you will love these. DIRECTIONS—in small bowl of food processor or a mini chopper, mix all ingredients. Process until smooth, stirring frequently, and working mixture as you process to incorporate all ingredients well. Measure a level tablespoon and shape into a small ball until mixture is used up and you have 10-12 balls of equal size. Place on parchment lined plate, cover, and refrigerate. Break chocolate bar into pieces and add to small double boiler or canning jar in a small saucepan of water. Gently heat water until chocolate is melted. 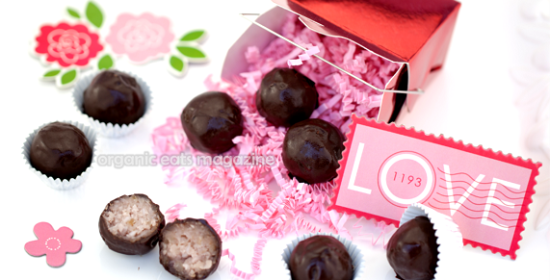 Using a spoon, dip each truffle ball in the melted chocolate. Place on parchment lined plate, refrigerate until the chocolate hardens. Note: like more chocolate verses filling? Dip the cooled truffle balls in the melted chocolate a second time. Store truffle bites in the refrigerator until ready to eat. Spoon leftover chocolate into small candy molds and refrigerate until hard or dip fresh berries into leftover melted chocolate. PASCHA’s chocolate philosophy is based on purity and minimalism – using only what is essential for excellent chocolate and ensuring every ingredient is as pure as possible. Cocoa itself is a very complex food, with several hundred individual compounds, many of which have very beneficial health impacts. This complexity expresses itself in different cocoa beans grown in different geographies and with different local environments. PASCHA’s goal, as a chocolatier, is to allow the simplest expression of this natural complexity to allow the taste and benefits to be enjoyed. In developing the PASCHA chocolate sourcing we visited organic Finca’s in Latin America, where one can see, side by side, growing wild in the same natural ecosystem, cocoa trees, sugar cane, vanilla, and some fruit. These are all the ingredients essential in achieving great chocolate, and they all grow naturally together. What we did not see on these Finca’s were ingredients such as nuts, soy, milk or wheat. These latter ingredients are the Western world’s development and “improvement” of the natural chocolate that nature has provided for thousands of years. PASCHA’s approach is to simply and fundamentally go back to the basic chocolate ingredients that nature provides and which naturally coexist together. Pure chocolate as perhaps nature intended.